Map uploaded by Addgene staff. Please use Rec A- competent cells such as Stbl3 cells from Invitrogen for transformation. 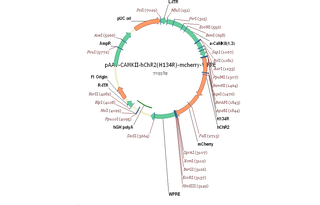 This plasmid contains the mouse calcium/calmodulin-dependent kinase II alpha subunit promoter. Ready-to-use AAV1 particles produced from pAAV-CaMKIIa-hChR2(H134R)-mCherry (#26975). In addition to the viral particles, you will also receive purified pAAV-CaMKIIa-hChR2(H134R)-mCherry plasmid DNA. CaMKIIa-driven, humanized channelrhodopsin H134R mutant fused to mCherry for optogenetic activation. These AAV preparations are suitable purity for injection into animals. Pricing $350 USD for preparation of 100 µL virus + $30 USD for plasmid. Storage Store at -80℃. Thaw just before use and keep on ice. Shipment Viral particles are shipped frozen on dry ice. Plasmid DNA (≥ 200ng) will also be included in the shipment. Addgene ensures high quality viral vectors by optimizing and standardizing production protocols and performing rigorous quality control (QC) (see a list of our QC assays). The specific QC assays performed varies for each viral lot. To learn which specific QC assays were performed on your lot, please contact us. Titer: the exact titer of your sample will be reported on the tube. The titer you see listed on this page is the guaranteed minimum titer. See how titers are measured. Visit our viral production page for more information. Ready-to-use AAV5 particles produced from pAAV-CaMKIIa-hChR2(H134R)-mCherry (#26975). 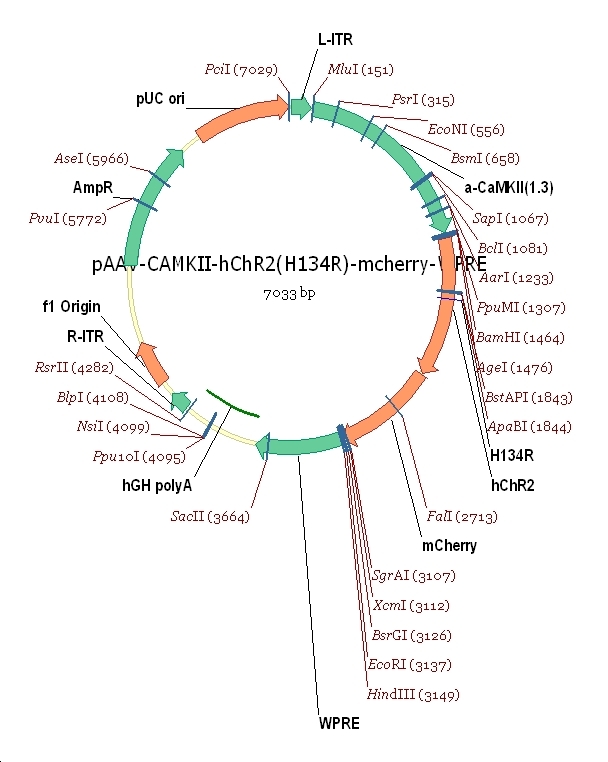 In addition to the viral particles, you will also receive purified pAAV-CaMKIIa-hChR2(H134R)-mCherry plasmid DNA. Ready-to-use AAV9 particles produced from pAAV-CaMKIIa-hChR2(H134R)-mCherry (#26975). 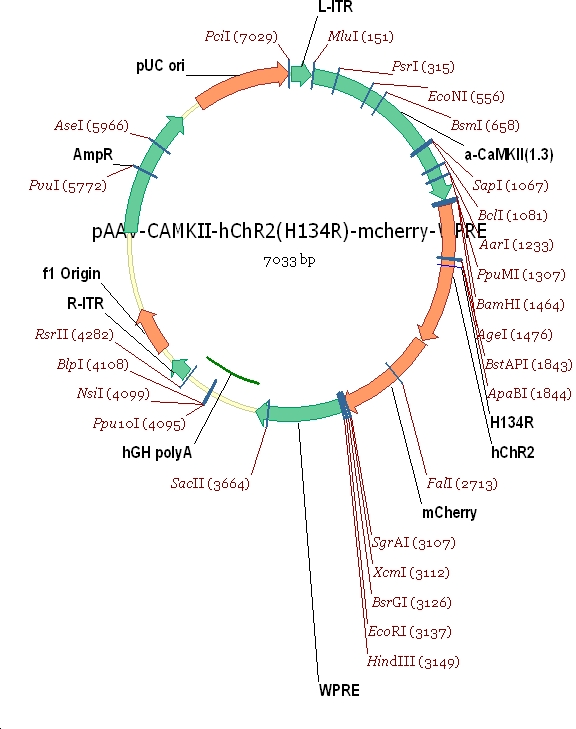 In addition to the viral particles, you will also receive purified pAAV-CaMKIIa-hChR2(H134R)-mCherry plasmid DNA.